A tranquil waterfront home filled with quiet elegance and charm is an idyllic retreat. 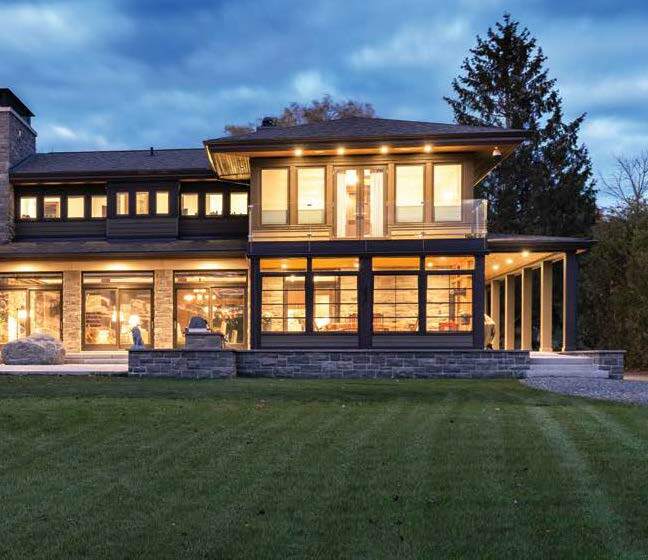 With its exquisite natural setting, horizontal lines and low-slung roofline, there’s no doubt Frank Lloyd Wright would have approved of this superbly crafted riverfront home in Manotick. 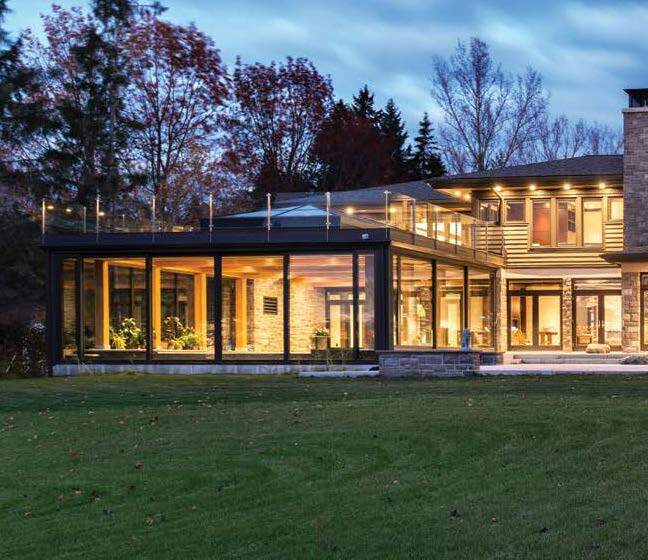 Located down a sweeping driveway and sheltered from passersby on River Road by a band of thick mature trees, the 8,500-square-foot custom home blends harmoniously with the idyllic landscape on the banks of the Rideau River. The homeowner, a retired father of four who lived in a Navan bungalow for years, bought the waterfront property in 2014. After deciding to retire from his engineering firm, he began an online search for an architect, making a list of names based on portfolios he admired. One of them was Malcolm Wildeboer of Vandenberg & Wildeboer Architects. 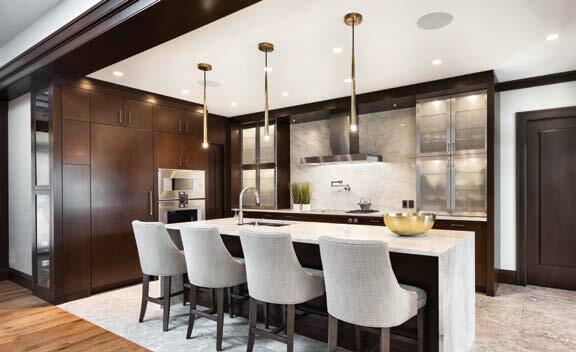 Jason Bellaire and Denise Hulaj of Ott awa’s StyleHaus Interiors, who had worked with Malcolm on another project, were brought on board and took the helm in selecting all furniture, accessories, millwork, ti le, window and wall treatments and lighting. It was the biggest job they have tackled to date, working with the client for 18 months. 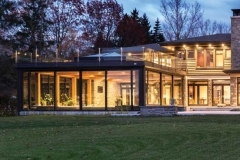 The project’s builder/contractor was D.C. Snelling Ltd.
“Our goal was to create a unique, comfortable family home with subtle, luxurious finishes that referenced the surrounding landscape. 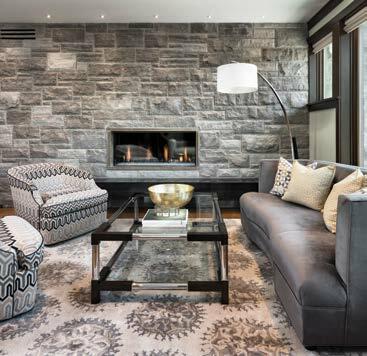 The interior design integrates harmoniously with the strong linear components of the architecture,” Denise says. 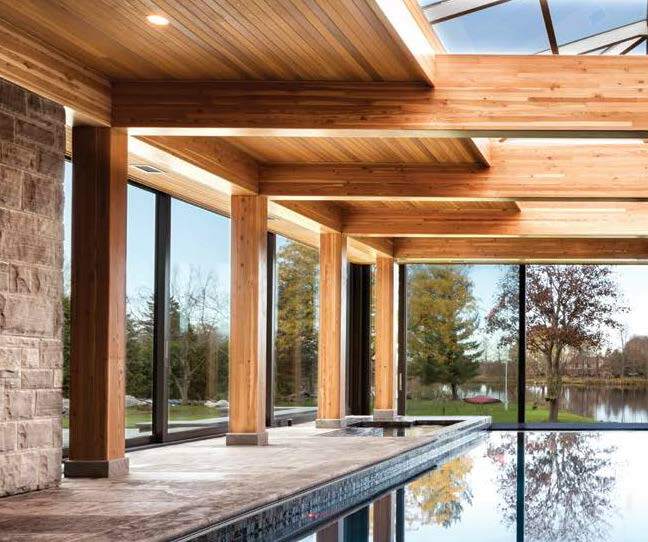 A tractor trailer full of Eramosa limestone was trucked in from Toronto and used throughout the home’s living areas, indoor pool surround, backyard patio and exterior stone walls. The swoon-worthy indoor-outdoor design is centred around a dazzling open kitchen and central island with Taj Mahal quartzite countertops and backsplash and a gorgeous living and dining area, offering stunning views of the water, expansive lawn and outdoor kitchen area. Fond of entertaining and cooking, the homeowners spend the majority of their time here preparing meals and relaxing in front of their fireplace, which is inserted into a stone wall that seemingly appears to rise out of the earth. A soothing, serene air pervades the home, thanks to its nature-inspired colour scheme, reclaimed elm flooring from Northern Wide Plank and classic trim – dark cherry in hazelnut from House of Fine Carpentry – which is consistent throughout the entire waterfront property. Custom millwork was designed by StyleHaus Interiors and fabricated and installed by LTR Industries and blends perfectly with the furnishings. Thinking ahead, the homeowners had an elevator installed for convenience later in life. 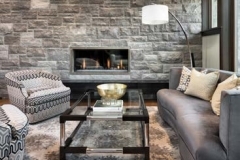 With several sitting areas boasting sublime views and five fireplaces to cozy up to, there’s much to admire. One of Malcolm’s favourite design elements, considered his signature, is a long corridor to the right of the main foyer that ends with a full-sized window, which brings the outside in. 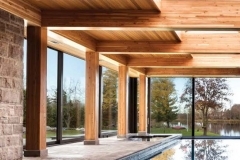 Tucked off of this corridor is an inviting indoor infinity pool and hot tub. 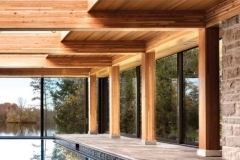 The homeowners, who enjoy a swim several times a week, say the waterline of the pool and river match up perfectly making it feel like you are immersed in one body of water. 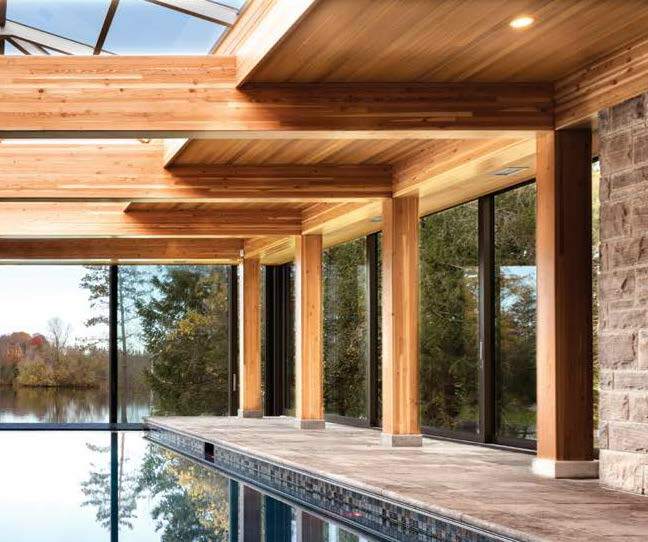 With plenty of wow appeal, the pool area was constructed by Roger Willis Contracting Ltd., and features Douglas Fir beams, a stunning cedar ceiling and 11-foot six-inch glass doors leading to the patio. Malcolm bets the doors are the tallest of any home in Ontario and were made in Germany. 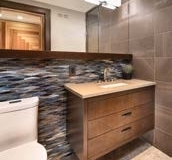 Even the guest change rooms and bathroom need to be inspected as they’re decked out in a water-inspired blue-and-white hexagon tile and hefty custom wood doors in a herringbone pattern, designed by Malcolm and replicated on the home’s cedar soffit. The master bedroom, located on the second floor, is a relaxing sanctuary with private balcony overlooking the water, ample storage, a large walk-in closet, luxe furnishings from Cadieux Interiors, custom drapery by Drapery Plus Decor and custom cherry millwork on all cabinetry, trim and doors. 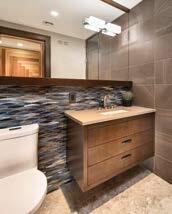 It’s easy to see why the master ensuite is one of Jason’s favourite rooms. 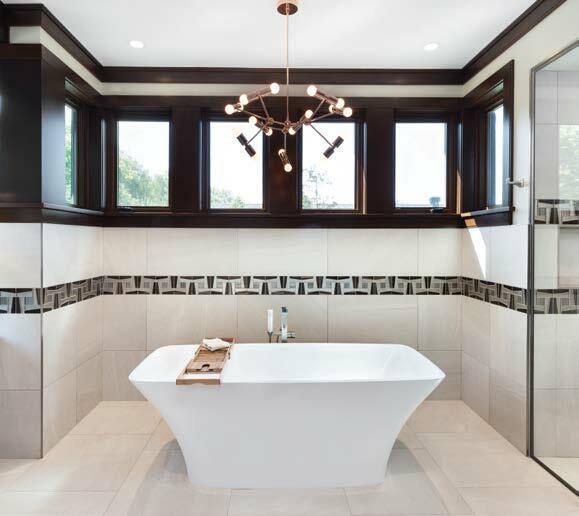 A winner at the 2017 Greater Ottawa Home Builders Association’s Housing Design Awards for custom bathrooms, the luxurious spa room features a stand-alone soaker tub with funky overhead chandelier by Toronto’s Lightmaker Studio, backlit vanity mirrors, walk-in steam shower, hammered nickel sinks by Native Trails and a band of windows offering views of the front lawn and trees. 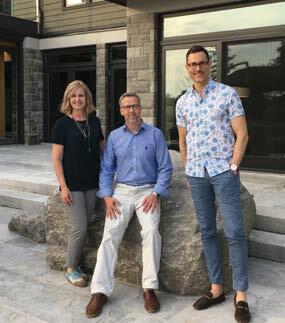 Denise Hulaj, left , and Jason Bellaire, right, of Ottawa’s StyleHaus Interiors spent 18 months working alongside Malcolm Wildeboer of Vandenberg & Wildeboer Architects, middle, on this sprawling custom Manotick home. A backlit onyx bar in the home’s entertainment area on the second floor was inspired by a trip taken by Denise to Portugal in 2004 and a visit to the bar in the Pestana Palace in Lisbon. Denise admits the palace, a national monument and hotel, left a lasting impression on her. She credits the homeowners with giving her creative license to replicate the palace’s onyx bar design, noting that her version came out better than the original. 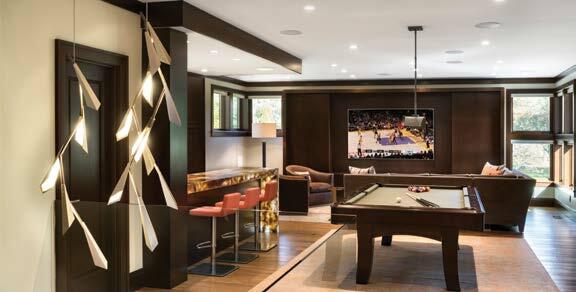 This room is game central when family and friends are over and boasts an 86-inch television, pool table and funky bar and barstools. 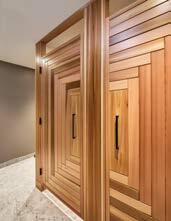 “The home was inspired by Frank Lloyd Wright’s work. I think we nailed it,” says Malcolm.